A quartet of major races at Yonkers on Saturday, April 26 included the finals of the ‘Levy’ and Matchmaker series and two generously funded consolations for participants of the events over the last six weeks. The biggest and best price was predicted in the TwinSpires harness blog last Thursday. Fashion Mystery won the Matchmaker Consolation, paying $43.80, $10.40 and $11.40 (ok). We engaged in the results of the other three features, though not with winners. In the Matchmaker Final, our choice—Yagonnakissmeornot—went off the favorite and finished second to the other horse we mentioned—Somewherovrarainbow—as a probable winner, though we thought that horse would be the choice. With no show wagering, our choice paid $2.30 and the Exacta with our other choice paid $10.80. In the Levy Final we went against stalwart Foiled Again and beat him, though we finished second (with Apprentice Hanover) to the race’s second-choice, PH Supercam. With no show wagering in this race, either, we picked up a generous place price of $8.80. The Levy Consolation went to the favorite and we were third with Word Power but there was no show wagering in this race, either. Over at the Meadowlands we were surprised to have chosen the dead-on choice in the W.N. Reynolds event for soph-colt pacers, though he won easily. Always B Miki paid $3.40, $2.80, $2.10. Friday, April 25 at Northfield, we also beat the favorite in the Courageous Lady but settled for second to a 20-1 shot. That Woman Hanover paid $7.60, $4.60, being sent off at 8-1. More horses to watch (H2W) result activity, listed below, was positive as across-the-board prices mostly shone and five win or place contenders teamed up with favorites to produce five exactas. 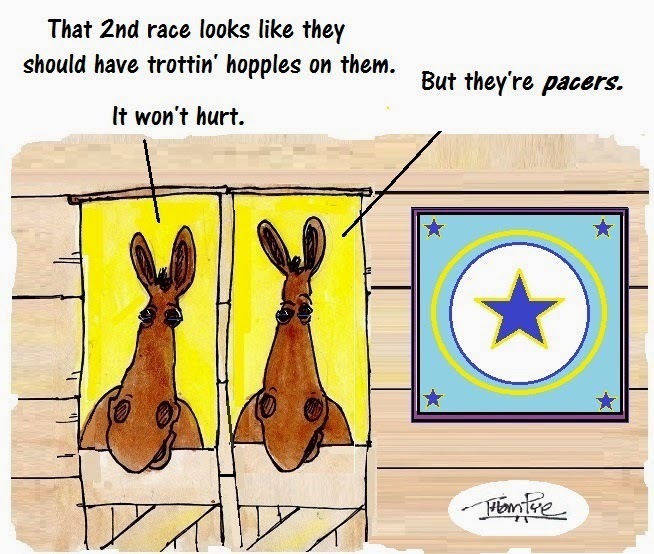 TwinSpires and Hoosier now has three power-packed programs for harness players. Tuesdays, wager all you want and earn 10 TSC Elite Points per dollar bet. Click here for details. Every Thursday night, there is a 20-percent bonus on hitting the Pick 4 starting at Race 3. Click here for details. And the ongoing 10-percent Pick-4 bonus every racing night on Pick-4 hits continues through the meet. Click here for details. Saturday, April 26, the morning qualifiers at The Meadowlands were raced over a track that was dry but dulled by overnight rain, with spring-like temperatures and a steady 10-15 mph breeze from the west (against the wind in the homestretch). Some stars from last season were out and winging. Now three, filly trotter Lifetime Pursuit won in 1:58.4 for trainer Jimmy Takter. Her main foe, Shake It Cerry, won in 1:58. Soph-colt trotters qualified, looking like a Hambo elimination. Father Patrick, the Hambletonian future book favorite, made his debut for Takter and was second to Odds On Amethyst in 1:54.1. Final preparations are under way for the ninth season of harness racing at Tioga Downs, with the first of 61 programs set for Saturday, May 3. While opening night post time will be 5:00 p.m. and Sunday afternoon cards will have a 1:30 p.m. start, evening cards have a new and earlier post time for 2014. Friday and Saturday night programs will begin at 6:15 p.m., as will the handful of non-holiday Monday and Thursday cards scheduled for the upcoming meet. Once again, the Cane Pace and Roll With Joe Pace headline as the racing season’s features, with top three-year-olds battling in the Cane Pace on Monday, Sept. 1 and older pacers contesting a $200,000 (est.) “Joe” purse on Sunday, June 1.